As we bring 2017 to a close, there is a lot to look back on. I know a lot happened to me this year, from graduating with my bachelors in music to changing the name of this very blog. I have some reflecting and planning to do. This past year brought with it many changes. I moved back home from college, worked a part time job before finding one full time, and I became more serious about sharing my music with the world. I also have a lot of exciting things planned for 2018. One of my goals for the year is to write and publish a couple different ebooks. 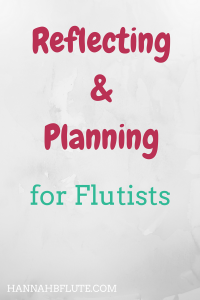 I also am working on a method book for older flute students. Getting my degree was probably my biggest accomplishment of the year. I got my bachelors of music in flute performance from a state university back in May. My college experience was not a normal one, but I am thankful for the experience I did have. I got to experience commuting and living on campus. My last two years of college gave me the chance to learn a different form of music performance: marching band. I took an on campus job as an opinion writer. I, somehow, managed the writing side of my life with music side. I even stayed close with one of my best friends since kindergarten. Even though we went to different colleges. At the time of graduation, I did not have a job or any income. So I decided to move back home. I have been able to save money, and I could take a job without having to worry so much about money. I could consider other factors, such as the drive and the job itself. It did take awhile before I found a job, but that’s okay. I was able to enjoy my last summer break of sorts. I did work part time for a couple of months still, but again, finances weren’t a huge stress. Moving home has also allowed me to reconnect with family and friends in my hometown. I have stayed super close with my parents. I even joined a couple of community music groups. Since being out of school, I have had more time for other things. In college, I tried to blog as much as I could, but classes took precedence. Now that I am not a student, my time outside of work is mine. Yes, I have a day job. No, I am not ashamed. That day job allows me to spend my free time working on my music and this blog. I don’t have to stress about finding paying gigs or jobs. I can focus on what I like. Maybe I will be able to make some money online one day. That is definitely something I want to work on in 2018. But the beauty of a day job is that I have more freedom to do what I want with this blog. I can grow it and work on products, but I don’t have to stress about paying the bills. If you haven’t been here long, you may not know that this blog used to be known as Killer Harmony. I had the name for almost two years before changing it to Hannah B Flute. The decision was hard, but it was necessary for my growth as a blogger. The old name no longer fit. 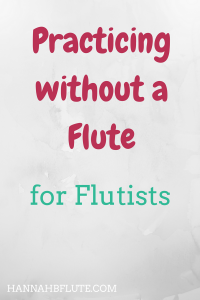 I had niched down to writing about music and the flute. I needed a name that reflected that. Killer Harmony was too general and not very professional. Hannah B Flute fits the blog more. At the beginning of the year, I hardly used Instagram. I wasn’t a big photographer, and I didn’t think it would do anything for me. Boy, was I wrong. I started posting about my life as a young musician back in April, giving up on it as solely a personal social network. Now, I have kept up with posting almost daily, sharing videos and behind the scenes photos of work for the blog and as a musician. I even reached 200 followers, a big deal for me. Check out my 2017bestnine! 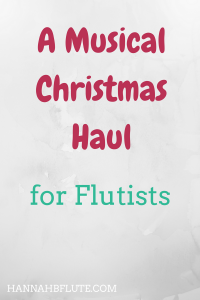 As I already mentioned, I have a couple of ebooks in the works as well as a flute method book. I also want to work on composing and arranging, too. Over the past few months, I have realized that I want to show others that you don’t have to be a “typical” musician to be successful. You don’t need to play in an orchestra to have a good career. Heck, you don’t even need to be a professional musician to be good at your instrument. I want to bust all of those myths about what it means to be a musician. What are your biggest accomplishments of 2017? What are you looking forward to in 2018? Let me know in the comments! Merry Christmas everyone! Yes, Christmas has finally come once again! In honor of the commonly celebrated holiday, I wanted to do a little Christmas haul for the blog. First, I want to make it clear that I am in no way trying to brag. I am merely telling/showing you all what I got as inspiration. If posts like these make you angry or upset, that is fine. This is your warning to click away and read some of my other posts. If you got some money or a gift card for Christmas, you can use that to get something from this post that interests you. If not, that’s cool too! Be sure to leave a comment below with your favorite Christmas (or Hanukkah) gift! One of the gifts I received this year was a music journal. It is pretty awesome, because the left side of each layout is lined just like normal notebook paper. The right side, however, has blank staves for composing! I have been wanting to get into composing and arranging for awhile, and I can’t always get into it using technology. This way, I can write stuff down with a pencil on paper. The journal is also smaller than typical letter paper. That makes it a perfect fit for a purse, in case I happen to need or want it on the go! I also got a set of three musical pencils. They are not the mechanical kind, so I will need to get a sharpener, but ya girl can never have too many pencils. Along with that, I got a spring pencil holder that attaches to a music stand. I don’t have to worry about pencils getting in the way of my music anymore. The spring for the holder clips onto the bottom rack of the stand. I can keep my pencils close by without them being in the way of anything. This gift came from my secret santa at work, and I have to say, they chose well! We did a secret santa gift exchange last week, and I got an Amazon gift card. If you didn’t know already, Amazon is my favorite online store. They have almost anything you could think of. It’s great. I’m not sure what I will use the gift card for yet, but they don’t expire, so I have time. 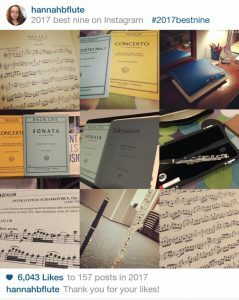 Over the years, I have amassed quite the collection of non-concert flutes. I have a couple recorders, a couple tin whistles, and even a Native American flute. Until now, I didn’t have an ocarina, but I wanted to add one to my inventory. I got a gorgeous 12 hole ocarina, and I can’t wait to learn how to play it. Ocarinas are nice and small, but they aren’t super high pitched. Nicola Mazzanti is an Italian flutist, most known for his piccolo playing. He wrote a comprehensive book for piccolo. I had wanted this book since I first heard about it last summer. While I considered putting it on my birthday list (July baby, right here), I decided to wait. It made it onto my Christmas list this year, and I am so happy to have received it! In case you haven’t been here long, I love the piccolo. It is a goal of mine to be known for my piccolo playing. So, I guess you could say I want to be the American female Nicola Mazzanti (lol). Anyway, I think this book will help me improve my piccolo playing. I have other books by Trevor Wye and Patricia Morris, but Mazzanti specializes in piccolo, the others don’t. Now for the granddaddy of my Christmas haul: a Fluterscooter bag! This was something I had wanted for quite some time, but I never had the courage (or whatever) to buy one for myself. They are a bit pricey, but I had heard so many good things about them that I had to get one. I feel especially lucky to have one, because the Cedar Wood bags have been on backorder since early December. If you would like to see a review/an update on what I keep in my flute bag, comment below! I’m sure I will do one or the other in the future, but let me know which (if either) you would like to see first! I did get some other gifts, like a book on personal finance, that don’t directly relate to music. So I decided to leave those out of this post. And again, I have to say THIS POST IS NOT ME BRAGGING. I know it may seem that way, but Christmas hauls have been a thing for years, and I thought I would jump on the train this time. Did you get any musical gifts this holiday season? What was your favorite? Let me know in the comments! Unless you have been under a rock for the past week, you probably heard about the FCC’s decision to end net neutrality. Net neutrality is what makes the internet open and free. Even though the FCC’s decision is final, there is still hope. Multiple state attorneys general are suing the FCC, and we can even get Congress involved. But we have to act. In today’s post, I am going to stem away from the normal music content. 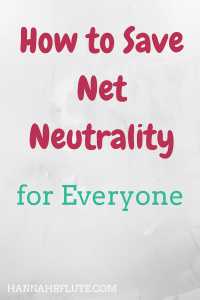 I’m going to write about how the whole issue of net neutrality affects us all, and how it affects this blog. Net neutrality was officially put into place by the FCC in 2015 under the Obama administration. The order barred internet service providers (ISPs) from charging more for certain websites or for a faster connection. Basically, it required ISPs like Verizon and Comcast to treat Facebook and Twitter the same as email. To treat small blogs like this one the same as larger sites like Google. It’s a pretty big deal. Without net neutrality, internet costs could skyrocket. Some people argue that the government should not be regulating the internet. That taking away net neutrality would spur competition within the internet market. The problem with that logic is that companies are money hungry. They know that the internet has become a vital part of many people’s lives. ISPs know that a lot of people will pay for internet, no matter the price. If ending net neutrality is anything like giving tax cuts to the rich, it will not help the average person. I don’t want to get too political, but trickle down economics doesn’t work. The future of this little blog is bleak, especially if the end of net neutrality takes effect. I’m a solo blogger with a full time day job. I can’t afford to pay ISPs to make my site faster. I may not even be able to run this blog anymore. It may not be worth it. Other small bloggers would probably agree. It takes a lot of work to run a blog, and most bloggers don’t have the same capital as huge corporations. We can’t afford to be in the so-called fast lane. Blogs and bloggers need net neutrality. Blog readers need net neutrality. The only groups that benefit from the FCC’s decision are the extremely wealthy and the larger corporations. The people and companies that can afford to pay a premium for internet service. Share posts like this one. Share the posts that list what you can do. Let others know that there is still a (small) bit of hope. You can contact your local representatives and tell them what you think. Check out articles like this one to find an ISP that still believes in a free and open internet. Avoid the ones that don’t or face premiums. Have you participated in the fight to save net neutrality? Will you do something? Let me know in the comments! Net neutrality is super important, especially for smaller websites like this one. In order to continue sharing my content with you all, I need to know that I can do that for free. I need to know that it is worth it.